Today, we celebrate George Washington’s birthday, a federal holiday that now is called President’s Day, even though its name has never been officially changed by law. Over the years, President’s Day has become a major target for retail businesses to offer huge sales. However, for horse racing fans, it offers a perfect day for the wild and woolly Southwest Stakes at Oaklawn Park. Last year’s running was the most exciting Derby trail race of the year, with Suddenbreakingnews’ banzai run, going from last to first in a field of fourteen. In this year’s Southwest Stakes, a field of thirteen battle for 17 Kentucky Derby points and a purse of $500,000. Starting in 2013, the race distance was increased from 1 mile to 1 1/16 miles. The Southwest Stakes usually spawns a couple of Kentucky Derby runners and attracts an average of 25,000 spectators yearly. In 2004, Smarty Jones won the Southwest Stakes and went on to win the Rebel Stakes, Arkansas Derby, Kentucky Derby and Preakness Stakes. He also came within one length of completing the Triple Crown with a second-place finish in the Belmont Stakes behind Birdstone. Handicapping a field of thirteen 3-year-olds, with a few talented runners racing off a long layoff, is extremely challenging —even more so when there is a 90 percent chance of rain and thunderstorms on race day at the time of this writing. Wet races are a handicapper’s nightmare, but often produce nice exotic payoffs, especially with a field of 13. Over half of the field has run on an off track at least once. The six who haven’t are: Cool Arrow, Silver Dust, Dilettante, One Liner, PC Cowboy and Chief Know It All. Seven horses are coming off wins in their last start: Cool Arrow, Silver Dust, Uncontested, Dilettante, Hence, One Liner and Chief Know It All. Cool Arrow is also entered in the Risen Star Stakes at Fair Grounds on Feb. 25. His last workout was on Friday, Feb. 17 at Fair Grounds. So, don’t be surprised if he gets scratched in favor of running in the Risen Star. Overall, the most accomplished colts in this field are Uncontested and Lookin At Lee. Read my Kentucky Derby contender profile on Uncontested by clicking here and find out why I am very high on him. Lookin At Lee is a consistent runner who has experience racing against top competition. He finished second behind Not This Time in the wet Iroquois Stakes at Churchill Downs, second behind Classic Empire in the Breeders’ Futurity and fourth in the Breeders’ Cup Juvenile. I really like this colt’s future moving forward under Hall of Fame trainer Steve Asmussen. Lookin At Lee has the same “closer” race style that worked very well for Suddenbreakingnews in last year’s Southwest Stakes. My only concern with him is the 107-day layoff. That being said, I think Uncontested and Lookin At Lee are relatively safe picks for your superfecta bets. In a field of thirteen, you have to narrow down a number of candidates that you don’t feel have in-the-money potential. Two that I eliminated very early were Cu Rahy and PC Cowboy. Cu Rahy finished eighth in his last start and fifth in the Smarty Jones Stakes behind Uncontested. This field is much deeper than he has seen in his last two starts. PC Cowboy finished third to Chief Know It All in his last start and they are starting right next to each other in this field. So, there are now nine horses remaining. When looking at Beyer and Equibase speed figures, five horses really stand out. Uncontested and Lookin At Lee, whom I already mentioned above, plus One Liner, Petrov and Dilettante. It’s his first start at Oaklawn Park. It’s his first two-turn race. He’s stretching out from 6 to 8 ½ furlongs. If it rains, it will be his first time racing on an off track. I still like him in my superfecta combinations and even better if the race is run on a dry, fast track. Petrov displayed a willingness to battle in the Smarty Jones Stakes with his second-place finish behind Uncontested. He received an 86 Beyer figure for that effort. If the race is run in the slop, he has run well in it already. The same can’t be said for Dilettante who scored an 88 BSF in his last start, a maiden win. He has yet to race on a muddy or sloppy track. Likewise, Steve Asmussen’s other entry, Hence, displayed a willingness to battle in the slop in an undercard race the day the Smarty Jones was run. He almost lost the lead by veering too far out to avoid some standing water near the rail and nearly slipped, but recovered to beat Horse Fly. A nice performance, but, at best, I would rank Hence mid-pack in this talented field. 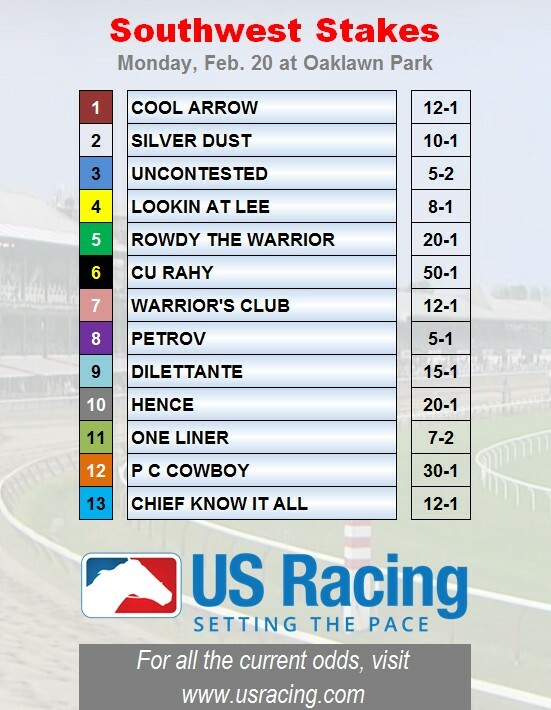 If this race is run on a dry, fast track, one horse that I think could be a sleeper is the Tapit colt Silver Dust. He has an inside post and great closing speed. So watch the weather reports. I am guessing that this race will be run in muddy or sloppy conditions. With this in mind, I like Uncontested for the win. In trifecta and superfecta bets, key him to win over three horses: Lookin At Lee, One Liner and Petrov. That is 3 over 4, 8 and 11. If this race is run on a dry, fast track, add in Silver Dust as he has the post-position and speed to potentially hang in the top four. Thomas Jefferson once described George Washington as “the best horseman of his age, and the most graceful figure that could be seen on horseback. “ Washington was also quite fond of two horses he owned: Blueskin and Nelson. 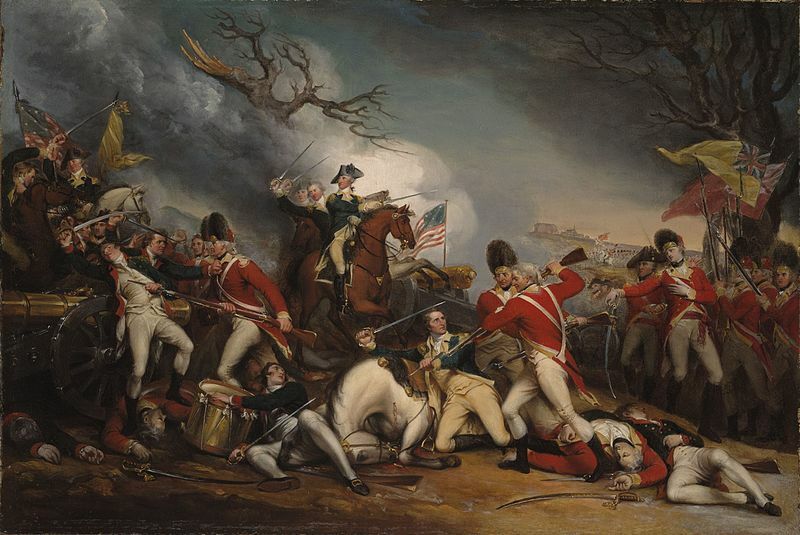 He rode both during the American Revolutionary War. Nelson was his best field battle horse, due to his calm demeanor under gun and canon fire. “Old Nelson” was the President’s favorite as he stabled him closest to his mansion in Mount Vernon. Nelson, a chestnut horse with a white blaze (white face), survived the war and lived to an age of 11, very old for a horse during that era. So on this President’s Day, remember the horse and rider — General Washington and Nelson — that played a very instrumental role in winning the war and the creation of our great country.